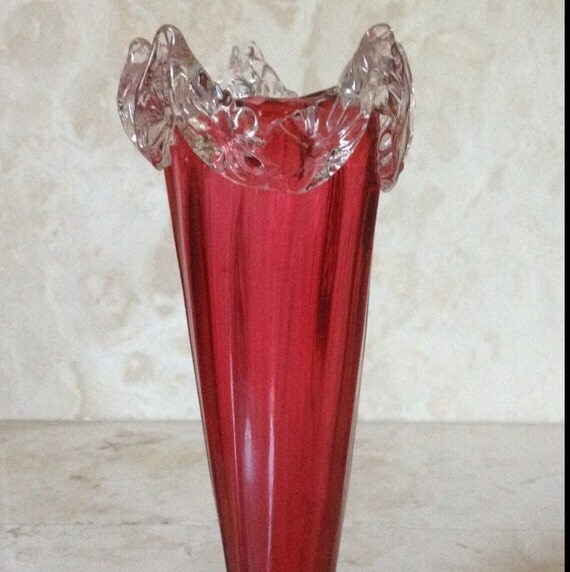 Antique Hand Blown Victorian Cranberry Vase that is decorated with applied crystal Rigaree. Rigaree is decoration on glass consisting of narrow applied bands forming parallel ribs. This can be seen in pictures The vase has with no chips, cracks, or dings and even the rigaree is stunning. This vase measures 6 inches tall. This dates to c: 1890. Antique Victorian Cranberry Vase The Applied Frilled Crystal creates a draped top edge. Attached at the base, the applied crystal expands appearing like flowers. This entry was posted in http://feedproxy.google.com/~r/JujubefunnyFinds/~3/yjwGjDO7MYE/antique-victorian-cranberry-vase-w1380961687 and tagged IFTTT. Bookmark the permalink.